Dermarolling / Microneedling / Re: Incorporating Copper Peptides into daily regime? In that thread is evidence that Pickart's before-and-after pictures are photoshopped, and that his 2nd generation "copper peptides" aren't copper peptides at all. You do not have to apply vit. C daily. Apply it in turns. One day vit, C (about 30min later) and the other day, apply copper peptides (also about 30 min later). You can also quit the vit. C application as you suggested. The copper peptide mask sachet contains a plastic-coated absorbing material soaked in a copper peptide serum. To use the mask efficiently, just cut off a small piece of the paper tissue and smear it on the area. Keep the rest of the mask (close the sachet with a paperclip) and every time, cut off a small piece. Dryness (even peeling skin), roughness, redness and temporary swelling are normal reactions after microneedling. Whiteheads or small bumps are not a standard reaction at all but in some individuals it happens. That is why we recommend doing a test patch first and we also recommend not to stamp or roll or needle extensive areas in one go but do just for example one cheek, when it heals do the other etc. In your case, stamp just a part of the cheek and when it heals, stamp another part. The whiteheads will eventually disappear. Did you stamp four days ago? Yes, you can use home remedies even after two days. If the scar is relatively thin, buy just our single needle. Needle the scar relatively deep every three weeks. You can use the single needle for product penetration as well. Just do not insert the full length of the needle. Insert just the tip. If you prefer, use a 1 mm dermastamp instead of the single needle. Bimatoprost is not officially indicated for eyebrows (only for eyelashes) but many people use it on eyebrows as well. Apply Bimatoprost after needling or stamping with the tips of the needles. Dermarolling / Microneedling / Re: Once dermarolling do i need to always apply sunscreen? I should have used the word "daily" for clarity. The daily upper limit is 4000 IU/day, as per Ross AC, Taylor CL, Yaktine AL Del Valle HB (2011). Dietary Reference Intakes for Calcium and Vitamin D. Washington, D.C: National Academies Press. p. 435. ISBN 0-309-16394-3. So that is well below the 10,000-20,000 IU I said was toxic. 10.000 IU is indeed not an acutely toxic dose. Taking doses in the same order of magnitude (40,000 IU/day instead of my 10,000 to 20,000) orally has proven to be toxic after a few months. If we take my upper quote for "toxicity", 20,000 IU, that's half of the dose that was found toxic in the studies. So my statement is correct, only not as an acute, but a chronic (daily) dose. Long-term intakes above the UL increase the risk of adverse health effects  (Table 4). Most reports suggest a toxicity threshold for vitamin D of 10,000 to 40,000 IU/day and serum 25(OH)D levels of 500–600 nmol/L (200–240 ng/mL). While symptoms of toxicity are unlikely at daily intakes below 10,000 IU/day, the FNB pointed to emerging science from national survey data, observational studies, and clinical trials suggesting that even lower vitamin D intakes and serum 25(OH)D levels might have adverse health effects over time. The FNB concluded that serum 25(OH)D levels above approximately 125–150 nmol/L (50–60 ng/mL) should be avoided, as even lower serum levels (approximately 75–120 nmol/L or 30–48 ng/mL) are associated with increases in all-cause mortality, greater risk of cancer at some sites like the pancreas, greater risk of cardiovascular events, and more falls and fractures among the elderly. The FNB committee cited research which found that vitamin D intakes of 5,000 IU/day achieved serum 25(OH)D concentrations between 100–150 nmol/L (40–60 ng/mL), but no greater. Applying an uncertainty factor of 20% to this intake value gave a UL of 4,000 IU which the FNB applied to children aged 9 and older, with corresponding lower amounts for younger children. Yes, hyperpigmentations must be protected from sun exposure as much as possible and you should always apply sunscreen on your face but you can occasionally expose the skin elsewhere to get vit. D.
The problem is that UV radiation damages collagen and it can damage DNA but at the same time it is crucial for our health because sunshine is by far our most effective source of vit. D, which forms in the skin upon sun exposure. Vit. D is very important for many reasons including proper functioning of our immune system - crucial to remain healthy. Many recent studies showed that vit. D even plays a role in cancer prevention. Thirty minutes of full-body sun exposure causes the synthesis of 10,000 to 20,000 IU vitamin D. Taking such amounts in supplements would be toxic - for a reason not fully understood. The levels are not toxic if triggered by sun exposure. Oral supplementation of vit. D is is not a full substitute for sun exposure. Vit. D, a hormone, really is intended to be created in our skin, not absorbed by our digestive system. However, supplementation and food intake with vit. D is better than nothing, especially in winter time. I am not advocating excessive sun exposure or sunbathing! I am advocating very reasonable, occasional, 15 minutes lasting sun exposure. You do not have to expose yourself very often. The half-life of vit. D is long - about 8 weeks. It means that the existing levels of vit. D in your body will halve every two months. Dermarolling / Microneedling / Re: Can I use hydrogen peroxide to disinfect my skin? Hydrogen peroxide is too damaging to the skin. Do not use it to disinfect the dermarolling tools either because it is actually not a very effective disinfectant. Yes, you can use a 0.5 mm roller in between the sessions with your 1 mm roller but wait a few days after rolling with a 1 mm roller. When the skin is not red, swollen, tender or dry from the 1 mm rolling, you can start with the 0.5 mm. For example, roll once in two weeks with a 1 mm roller and twice a week with a 0.5 mm roller. Dermarolling / Microneedling / Re: can I use the Hyaluronic acid serum 100% pure? Most likely, it will not be absorbed into the skin and it will stay on its surface. The skin is not easily penetrable because it is supposed to protect us. Not at least a 2.0 mm but at least a 0.2 mm. If you are relatively young, your skin has enough of its own hyaluronic acid. No need for supplying the skin with it. Only if you're planning on buying several dermastamps or dermarollers and are planning to needle long-term, otherwise a DermaJet would be more expensive and hence overkill. The device would be very easy to sell second-hand though, since we'll be selling spare needle cartridges for $9,-. I am sorry for the delayed answer. We have a few customers who reported improvement of scars on the nose after stamping but if the scars are not too bad or they are just pores, I think it is not worth risking bad healing. Concerning the cheeks and the forehead: I think in your case a 2 mm dermastamp is overkill, especially because your cheeks seem to have just pores and a few scars but not standard deep icepick acne scars. First try your dermastamp several times on the same small area of the cheeks to see how the pores and scars react to it. There is hardly any tool more suitable for many stretch marks than the Dermajet. It is absolutely perfect for that. Start with 1 mm size and you can later, after lots of experience go for 1.5 mm. If you bleed a lot with the 1 mm size, do not use the 1.5 mm one. 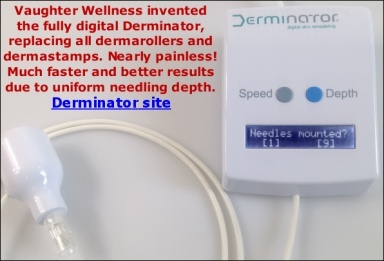 The Dermajet is even more intensive and "aggressive" treatment than manual single needling so do it only once in 5-6 weeks. Never treat large areas in one go. Treat a small area, when it heals, treat another. Right after needling, massage our 0.1% Tretinoin cream into the individual stretch marks. First do a small test patch to see how your skin reacts to it. Significant, long lasting redness and stinging is completely normal. Apply our Infadolan ointment on top of Tretinoin cream. The weeks in between needling, keep the treatd area moisturized, apply vit. C and Tretinoin at least twice a week. Do not apply both the same day. Use the same 1 mm size for your acne scars on the chest and for your surgical scar on the knee. Concerning wrinkles, it is suitable but I have not yet completed tests regarding the best needle length for various areas so I have to tell you later. Indeed, for many people it will be "psychologically" much easier to simly move a machine over their skin than to physically stamp the skin themselves. And also less painful. My husband for example has always resisted any type of dermaneedling that I wanted to perfiorm on his skin for testing purposes (documenting the improvement of certain scars). Thank you, NomorScars, for your answer.